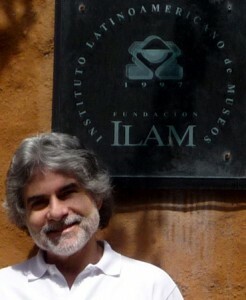 Fernando today, in front of the ILAM in San José, Costa Rica. I studied fine arts for four years, and developed an activity as an artist in three exhibitions. Later I studied graphic design for two years, having worked briefly as an assistant designer. I was then 26 years old, and had some knowledge of art history and aesthetic sensibility. In 1986 I began studying art history in college (BA, MA History Art), and I saw a notice posted requesting an assistant to the registrar at the Museum of Contemporary Art in Caracas (MACC, in spanish), Venezuela. Required studies art history, knowledge of art handling, conservation, English, organizational skills, responsibility, etc. I submitted my CV. I did the interview rigor, including the translation of a press report that made the museum on a grand exhibition of the English sculptor Henry Moore few months earlier. This was in April 1986. I was excited but worried because there was another candidate who studied Arts in England and had excellent English. But on the 28th I was called to give me the good news that I had been selected for the position. Very happy, I started on 2 May. I had some “advantage” because I knew quite well the largest museums of Caracas, and much of its permanent collections, including the Museum of Contemporary Art itself. The English translation was done very well, as I concentrated on the Spanish translate ideas and concepts rather than to translate word for word. Anyway, I began my career, and to date (December 2012). I have accumulated 26 years of continuous experience, always intense study. Common sense has led me to investigate how different objects are registered, whether cultural, or technological, natural or naturalculturales. I was at the MACC until 1993, after which I began to provide advice to other museums of Caracas and Venezuela, where I developed a record structure and current computerized cataloging. In 2006 I started writing articles in newspapers and magazines specialized museological on that experience, and develop virtual catalogs for some museums of the Western world. Since 2007 I started as a professor at the Latin American Institute of Museums (ILAM, in spanish), sited in Costa Rica, where I teach courses online and face on the same subject, plus related topics. I have always held to reflect on our profession, and I am actively linked with institutions and professionals from many countries. Fernando, felicitaciones por tu trayectoria a partir de las artes que dan una visión universal del Hombre y sus obras.